Yajirobe hardly ever fights. The only time he's useful is when he cut off Vegeta's tail in the early episodes. Then he tried to slice Vegeta up when his back was turned... Vegeta turned around and made him wish he never even thought about that little idea. Yajirobe's pretty much the biggest coward in DBZ. All he ever does is eat. 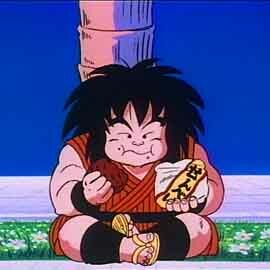 Yajirobe wouldn't even go in the room of Spirit and Time with Krillin, Tien, Chiautzu, and Yamcha. You'll usually find em' in Korin's place, playing poker or eating.